If you're a longtime reader of this blog, you should be familiar with my love for all sorts of complex board games, which often feature dozens if not hundreds of individual components. While most such games come with small resealable plastic bags to keep them separate, having to deal with all these individual baggies can still be a major hassle while trying to setup or play one of these type of games. 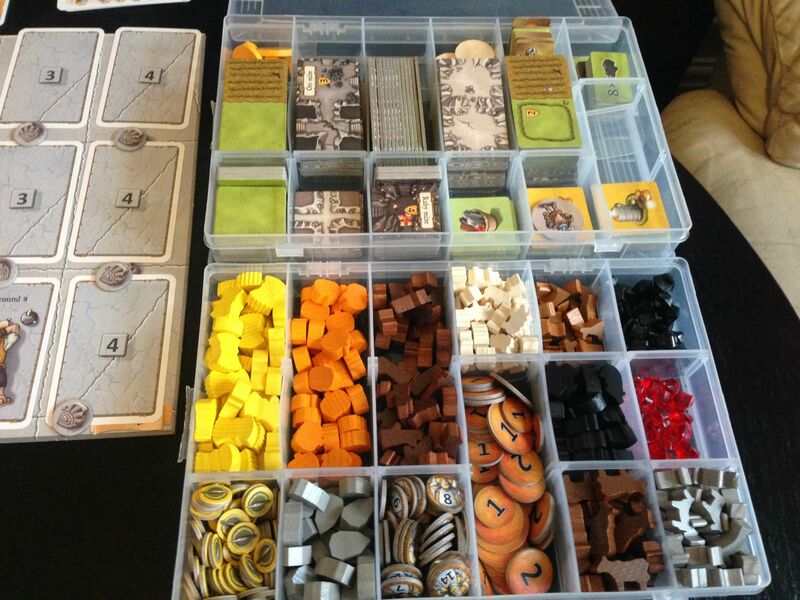 This is particularly true for Caverna, which I reviewed earlier this week. The game includes 14 different wooden bits for various components, as well as almost a dozen different squares and rectangles that represent the various mines, fields, pastures, and chambers you can construct. With such a crazy number of components, finding a way to easily store and organize all these pieces becomes necessary if you want to be able to setup and play the game in a reasonable amount of time. So what's the solution? Small, customizable plastic containers like the ones shown above are just what you need. After I first discovered these, I wondered how I ever played without them. These comes in a variety of shapes and sizes, and typically the length or width of the individual trays can be adjusted as well. Specifically, if you're looking for storage for Caverna, you should order this bin and this one , both made by Plano and available from Amazon. With them, you can organize just about every piece in the game, and still fit both the storage bins and the game boards inside the original box. Or, if you're just looking for something you can use for multiple different games, I personally recommend this particularly organizer , also by Plano and available from Amazon.